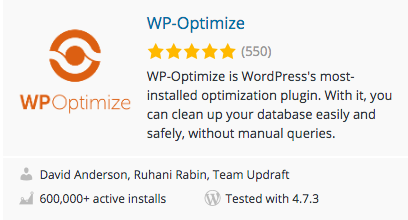 Our team confirmed today that WP-Optimize has passed the 600k install milestone. This is the first major milestone since UpdraftPlus acquired the plugin from Ruhani Rabin at the end of 2016. We’ve already released a lot of internal improvements and bug fixes in the last few months. We’ve also been busy preparing a number of new Premium features, such as multisite support, the ability to optimise individual tables as well as InnoDB – these should be released in the coming weeks. In the long term, we’re looking at optimising images and all aspects of a website – not just the database. We’re thoroughly enjoying the challenge and a big thank you to all our users! The post WP-Optimize passes 600k installs, announces new features appeared first on UpdraftPlus. UpdraftPlus – Backup, restore and migration plugin for WordPress.